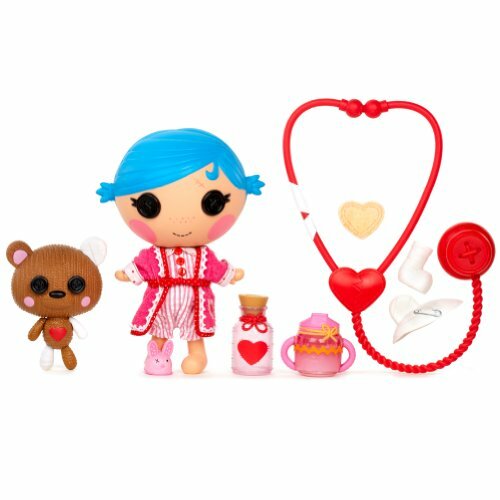 The Lalaloopsy Littles Stumbles Bumps 'n' Bruises Sew Cute Patient doll delivers kids ages four years and up a fun and colorful way to play doctor. The doll comes with accessories that add to the fun and a pet bear that could also use some healing. Kids will enjoy the doll's wacky, colorful appear as they care for her bumps and bruises. The Stumbles Bumps 'n' Bruises Sew Cute Patient doll features an adorable round face, button eyes, and a personality all her own. Created from the cloth of a nurse's dress, she's a little clumsy but often a good patient. 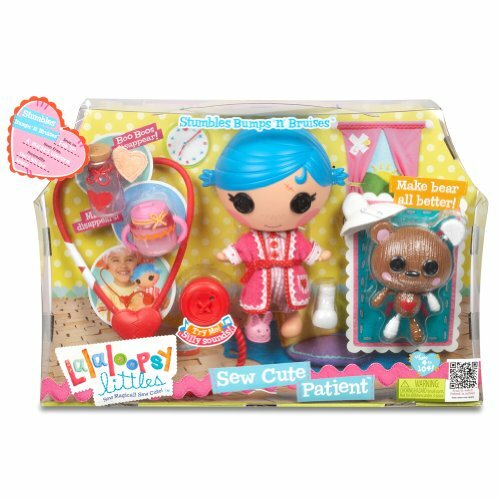 Like all Lalaloopsy dolls and Loopsy Littles Dolls, she was as soon as a rag doll who came to life just as her last stitches were sewn. This doll is coming down having a case of the sillies, so it's a excellent thing she has the tools to help her get better. The marks--which have a color-change feature--will vanish when in contact with hot water. Fill the included medicine bottle with hot water and soak the heart-shaped bandage to wipe away the bumps and bruises on her face. Monitor this doll's heartbeat making use of the included stethoscope. The liquid in the cup will appear to drain, offering a fun play detail that young kids will enjoy. Pet Bear Doll with Detachable Features Place the stethoscope against her heart and press down to hear the fun sound effects--from croaking frogs and goofy whistles to a ticking clock. To feed her, put the sippy cup with"disappearing milk"up to her mouth and tilt. This doll's pet bear could also use some TLC. He's constructed of durable plastic with a textured, knit-like surface. What's in the Box Reassemble the bear's arms, legs, and ears to make him better and bring him back to life. Package Dim. : Height: 3.8" Length: 14.8" Width: 10.1"